Though you would rather be riding your dirt bike than washing it, a long weekend of riding at the track or on the trails can certainly put a damper on your dirt bike’s aesthetics. As with any kind of machinery, there is a right way and a wrong way of cleaning a dirt bike. We took the liberty of putting together a quick and easy cleaning guide, so you can learn how to clean your dirt bike the right way and restore your favorite machine to showroom quality, at least for now. Preparation is key when it comes to properly cleaning a dirt bike, and a clean dirt bike is the first step in proper dirt bike maintenance. Before you get started, you will need to gather all your cleaning supplies and tools: a wash bucket, a bike stand, a soft brush, an exhaust pipe plug, duct tape, a rubber mallet, a mild dishwashing detergent or soap (but a dirt bike-specific wash works best), a spray bottle, a compressed air can, abrasive cleaning pads, steel wool pads, WD-40 or some other penetrating lube, dielectric grease, an airbox cover, a wire brush, clean towels, microfiber towels, a contact cleaning solution, and a spray polish. To save yourself some time and effort, you may want to invest in or even rent a pressure washer. After all, that plastered dirt, mud, and sand won’t be easy to get off in your first attempt. In fact, you will want to carefully knock off any excess dirt using a rubber mallet and remove most of the grease from your chain using a wire brush. Remove the seat and the handlebar pad. If you decide to leave the seat on, just remember that the foam can break down and deteriorate if it is exposed to too much water. Reinstall the seat bolts so that the shrouds don’t flop around. Seal any overflow hoses that could be at risk of catching water by plugging the end with a spare bolt. Install a wash plug in the muffler or cover the end with duct tape, so water can’t get into your engine. If you decide to leave the seat on and the air filter in, remember to seal the airbox holes with duct tape. Cleaning a dirt bike may sound like an easy task, but there is a right way and a wrong way to give your favorite machine some tender loving care. Start by laying the bike on its side, so you can reach those hard-to-clean areas underneath the cases, fenders, and tank, with the handlebar resting on the bike stand. 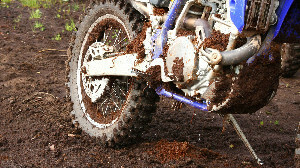 Lightly spray the bike with water to loosen and soften any remaining dirt or debris. Let the bike sit as it for a moment before you start power-washing. Try to avoid spraying the bearings, seals, or electrical components directly. Once that side is clean, lay the bike down on the other side, with the handlebar resting on the bike stand. If you happen to have a skid plate, go ahead and remove it. Clean this side thoroughly, following all the same steps. Scrub the underside of the frame. If your frame is made of aluminum, you can safely use a steel wool scouring pad, such as S.O.S. by Clorox. You can also use an abrasive cleaning pad, such as Scotch-Brite by 3M, with a little bit of penetrating lubricant to help remove any stubborn dirt or mineral deposits. Hose the bike off once you are done. Restore your dirt bike to its upright position and spray the bike with your soap solution or a dirt bike-specific wash. Let the solution sit for several minutes and then scrub the bike down using a soft brush. Hose the bike off again from top to bottom. Scrub the swingarm, the spokes, and the frame. Hose the bike off once again. Even though your bike may be clean, you shouldn’t inspect it for maintenance issues or take it out for a spin until it is completely dry. Use a clean towel and a can of compressed air to dry the bike and access those hard-to-reach areas. You can safely dry electrical fittings using compressed air. Once those fittings are dry, you should apply a dielectric grease to the connectors to keep water out in the future. Use compressed air to reach the radiator fins, blowing only from the front to the back of the bike. Clean and dry the lower fork legs using a microfiber cloth. Before you move on, check for water spots. Use the can of compressed air and penetrating lubricant to also clean and remove water from the chain. Give your chain a healthy dose of chain lube and double check that all cables are water-free. To finish up, use a contact cleaning solution to remove any black marks that remain. Spray the dirt bike polish directly onto a clean microfiber cloth so you can detail the bike without making the brake discs or the seat too slippery. Built-up dirt will wear out your chain and the shock bumper of your bike but mud and debris aren’t good for any part in the long run. Now that you know how to clean your dirt bike properly, we hope that you will take great care in coming up with a cleaning schedule that doesn’t get in the way of your riding time. If you have any questions about this guide or would like to learn more about the diverse selection of dirt bike parts available at KTM Parts Nation, contact us today!